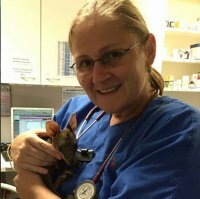 Patrice qualified in New Zealand in 1995 with a Diploma in Veterinary Nursing where she worked for 10 years as a small and Large Animal Veterinary Nurse. Patrice then moved to Melbourne with her now husband where she worked in a small animal practice before moving to Brisbane where she completed her Diploma in Emergency and Critical Care and Diploma in Leadership and Management. Patrice has worked in Emergency now for over 10 years and manages the team of nurses at the Underwood practice. Patrice enjoys spending her spare time with her husband, 3 children and their Husky ‘Maya’, Schnauzer ‘Bingo’ and last but not least Moggy “Freddie’.